Drumstick curry with tomato gravy. Update: This vegetable is being promoted by The Himalayan Universe. They are promoting munaga kaya for its miraculous properties to eliminate malnutrition among poor children. Munaga kaaya or Munaga kaara is popularly known as Drumsticks all over India, the reason they got the name from the fact that they do resemble the musical drumsticks. The drumstick tree is often referred as horseradish tree and the botanical name is Moringa oleifera. Drumsticks are widely used in Indian cooking, especially in South India. The drumsticks are green skinned, tough, grows 1-2 feet long, and is a sticklike vegetable, which is surprisingly soft and fleshy inside. The opaque white flesh, surround the seeds ( shaped like a pea), covered in layers of skins, is sweetish and nutty, fragrant, and tasty to eat, when cooked. Also the leaves are used a lot in Indian cooking which is highly nutritious, contains good source of beta-carotene, Vitamin C, protein, iron and potassium. Often these leaves are cooked with lentils and potatoes, used as a substitute for fresh spinach. In some places even the flowers are used in cooking. This tree is a good source for calcium and phosphorus. Drumsticks tomato curry is a simple sweet, tangy and spicy gravy curry, cooked with onions, tomatoes, minimal spices (like chilli powder and turmeric) and aromatic curry leaves .Sweet and creamy flesh drumsticks absorb all the flavors of tomatoes, onions and spices all the way when cooked has an irresistible taste and satisfies everyone’s taste which can served with rice and roties (Indian bread). 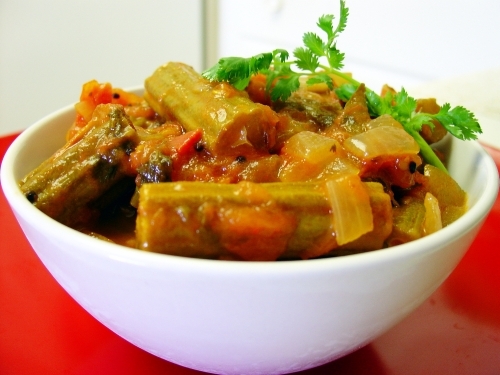 Drumstick sambar (lentil stew) is a popular dish all over India. Cut drumsticks into 1″-1 ½ ” long pieces. Heat oil in a shallow pan and add the seasoning ingredients and sauté allow mustard seeds to splutter, put the curry leaves, chopped onions and chillies, turmeric and sauté till onions turn translucent. Now add red chilli powder, chopped tomatoes and cook until the tomatoes become soft and mushy (it takes around 5-6 minutes). Add salt, drumsticks and 1-1 ½ cup water, cover the pan and allow it to cook on a low flame. Keep stirring in between till done (its takes 20-25 minutes). Add water if needed and adjust the seasoning. Cook for couple more minutes, turn off the heat garnish with coriander leaves. Serve hot with rice or choice of meal. Do not over cook the drumsticks, don’t stir too much as the drumsticks will fall apart. You can slightly scrape the ridges (with peeler) if you want. The gravy should not be runny or thick. You can add little yogurt or cream at the end if you like. You can also add garlic. You can also use frozen drumsticks for this curry but the fresh tastes really good. i love this curry!! !looking colorfull!! Swapna this is one of my fav curries. Thanks Asha, its for u, enjoy!:D. BTW what is FH?? loved the recipe, fabulous photo…. welcome back. never made kura out of munakaya. lucky, you get fresh ones. we get only frozen here. Your recipe is so beautifully illustrating the preparation of Munaga kaya curry and we have been promoting Moringa Tree (Munaga kaaya) not only for its good curry, but also as a miracle tree to improve nutrition among poverty stricken, malnutritioned children and people in the region. 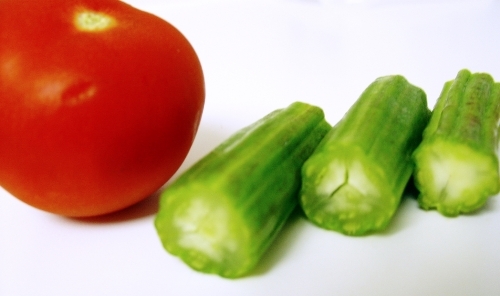 Even if people eat Moringa leaves or the pods or the drumsticks, once in a while, the chances are that they receive most of the micro-nutrients. dish looks so delicious! i want to try this, but with frozen drumstick. thats one of the yummiest drumstick recipe i have ever come across dear. i have got some fresh drumsticks from indian grocery shop. cant wait to try this one. Munaga kaaya curry taste really delicious, give it a try . You can use frozen one’s also. This is the first time in 3yrs I got fresh one’s in VA. I use to get fresh one’s in CA during summer. BTW it was quite expensive;) . Thank you for your promptness. I provided a link to your website from my blog. Richa , lemme know when you try it. Sia, thanks for the FH abbreviation:) it din’t strike me. I’m sure you will love the curry. Enjoy. This gravy is looking YUM!……Nice picture…. Thanks Sukanya and welcome to my virtual cooking. Good to see u back sandeepa. Lemme know how the dish turned out. Thanks for dropping by shanti. I’m gald you liked it. Shivapriya, Welcome back girl. I love drumstick. It always adds extra something to any dish isn’t it? Lovely presentation and I am sure it must have been tasting great right? Thanks Seema, it sure did! Hi Shivapriya! first time at your blog. Misses a lot. This curry looks great and beautiful pics too. Nice blog with yuumy recipes. Thanks for sharing. Welcome to my site. Thanks for dropping by. Akbari Gunturi, I’m really glad u enjoyed the curry.